Packaging has become a huge part of our lives. Almost all of the items we purchase come wrapped, often in plastic film, surrounded by pellets or enveloped in polystyrene. But now a natural, biodegradable packaging is available that is literally grown! EcoCradleTM, ‘mushroom packaging’, launched by Ecovative Design in 2010, is grown, using fungi cultured on a medium of husks, hulls and woody biomass of different agricultural wastes including rice, soy and cotton. These waste materials are the substrate to which the fungal mycelium, essentially the root system of the fungus, is added. As the mycelium grows through the waste it secretes enzymes which decompose the waste – these two processes bind and convert the waste into a structured, cohesive product1. Mycelium from the phylum Basidiomycota (a group that includes mushrooms and toadstools, bracket fungi, puffballs, rusts and smuts, amongst others) are used to grow the packaging. As different species of Basidomycota display different characteristics, the exact species used in producing the packaging is dependent upon the specific packaging requirements, e.g., thickness or strength1. The final stage of the production process stabilises the fungus, in effect stopping further growth and preventing fungal spores being produced2. In a controlled environment mushroom packaging can be grown within one week. EcoCradleTM has proved to be as lightweight, strong and durable as its petroleum-based plastic counterpart. It offers thermal and physical protection comparable to polystyrene packaging, as well as displaying flame resistant and insulating properties. These unique features have led to it being also used as house insulation. Steelcase Inc is one company already using EcoCradleTM packaging to protect their furniture products during shipment. Why do we need alternative packaging options? Plastic accounts for over 50% of all retail packaging3. Relatively cheap, lightweight, strong, and durable, plastic is a versatile material that can be moulded into many different shapes, thickness, size and colours4. It is increasingly replacing many traditional materials, such as wood, glass, metal, ceramic, and paper, in a variety of uses. In 2009, 230 million tonnes of plastic was produced globally for use in a wide variety of applications from motor vehicle components to plastic bags drinking cups, foam pellets and rigid moulded packaging5, 6. In 2008 the European Union generated 15.6 million tonnes of plastic, UNEP estimates that each person in Europe uses 100kg of plastic materials annually, and this is estimated to reach 140kg by 20157. Plastic manufacture impacts the environment in many ways. Apart from contributing to the depletion of fossil fuel resources8, plastics production uses and creates large quantities of chemical pollutants, such as bisphenol A(BPA)9, styrene, benzene — a known carcinogen, and dioxins, all of which may contaminate water, air or soil10, 8. Potentially harmful emissions, released during manufacture or breakdown in the environment, include heavy metals, chlorofluorocarbons (CFCs), polycyclic aromatic hydrocarbons (PAHs), volatile organic compounds (VOCs), sulphur oxides and dust which can contribute to ozone depletion, smog, acid rain, and increased levels of carcinogens in our environment8, 11. Most plastics continue to be an environmental hazard after use. The majority of plastic packaging is not biodegradable and some will remain in the environment for many hundreds of years. 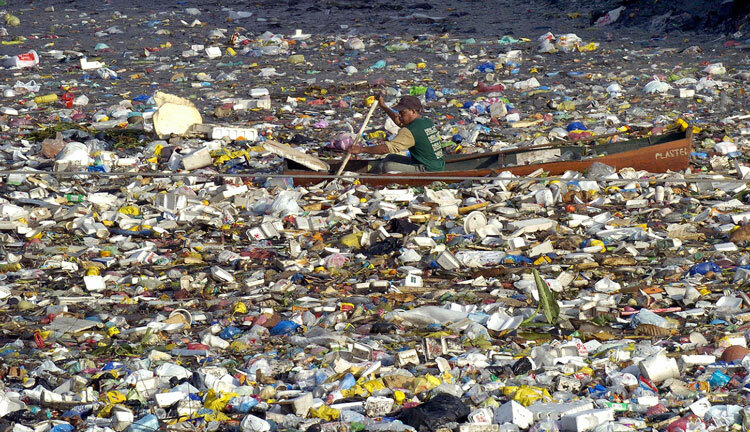 Shipped around the world, much plastic has been discarded into the sea as well as into landfills. Once at sea the plastic floats, only slowly breaking down through the affect of the sun and the waves into ever smaller pieces. Ocean currents have caused the waste to collect in specific regions and in 1997 the ‘Great Pacific Garbage Patch’ was discovered in the north Pacific10. Since then four more floating plastic ‘islands’ have been found in the world’s oceans. An estimated 80-90%12, 4, 10 of all marine debris is plastic, and whether a recognisable product or microscopic particles it endangers virtually all marine life12. To the extent it enters the food chain, it can potentially affect humans as well. The United Nations Environment Programme (UNEP) identified plastic pollution as one of two key emerging issues in global environmental protection7. New research reported in UNEP’s 2011 Year Book, suggests that plastic broken down in the oceans into small fragments, together with pellets discharged by industry may absorb a range of toxic chemicals linked to cancer and impacts the reproductive processes of humans and wildlife7. In particular UNEP raises the issue of persistent, bio-accumulating and toxic substances associated with plastic marine waste that cause chronic effects through endocrine disruption, mutagenicity and carcinogenicity. The potential threats to human and ecosystem health increases as the toxins move up the food chain7. UNEP calls for more research into the impact of plastics in the marine environment. Production of EcoCradleTM packaging material from mycelia and waste reportedly uses only 12% of the energy normally required in the manufacture of plastic packaging at the same time reducing carbon emissions by up to 90%1. This huge carbon and energy saving is achieved by the use of renewable resources in ‘growing’ the packaging and the minimal emissions resulting from less energy used in the production process. Being an all natural biodegradable product once no longer useful this innovative packaging can easily be discarded into a compost bin or shredded for distribution directly on the soil. It decomposes within 30-90 days, returning nutrients to the environment9. In addition to these environmental benefits, this new approach to packaging creates economic opportunities for rural communities by transforming former agri-waste products, and possibly burdens on local landfill facilities, into potential sources of farm revenue. Packaging is the single largest consumer of plastic accounting for 40% of this €300billion-a-year industry in Europe6. Globally packaging industry sales, worth approximately US $429 billion in 200913, is projected to rise to US $539 billion by 201414. The global market for sustainable packaging, which includes bio-plastics (see Box 1) and packaging made from plants, is estimated to reach US $142.42 billion by 201515. Currently, the bio-plastics market amounts to just 1% of standard petrochemical-based polymer plastic sales. However the bio-plastics market is projected to reach 125,000 tonnes in 2010 with a market value projected at US $454m16. Historically, the cheap price of oil has lead to limited development of this market, however, as oil prices continue to rise, the demand for environmentally friendly products grows, and polluters are forced to pay for the environmental damages they cause, the price gap between plastic and alternative packaging products will narrow. There is no clear definition of the term bio-plastics. Bio-plastic means different things to different people. The common understanding is that bio-plastics are made of renewable resources and are completely biodegradable17, but this is not necessarily the case. Biodegradable or compostable plastic is different from degradable plastic, which is a conventional plastic with an additive that helps it break down over a very long periods of time. Four facts serve to make this a very tricky issue. Bio-based plastics are not always biodegradable. Biodegradable plastics are not always made of renewable resources. Traditional petroleum based plastics can be biodegradable. A bio-based plastic is a plastic derived from a renewable source, but many bio-based plastics can also a contain significant amount of petroleum products. Bio-based materials are made entirely or partly from biomass. Biomass comes from animals or plants that can be rapidly re-grown. This excludes fossil fuels from being called bio-based, even though technically they are made from plants and animals from the distant past. Chemicals made from starch, plant products, and insulation made from sheep’s wool are bio-based materials. Bottom line: Check your packaging carefully for the appropriate disposal method. While little information is available on the economic costs of marine litter19, it does present serious socio-economic impacts on various sectors and authorities19. A report by Hall (2000) found that local communities and businesses were faced with substantial costs and polluters were not being made to pay for their actions. In 2004 UK local authorities, industry and coastal communities spend almost £14 million cleaning up marine litter 16, 7. These costs are even greater when other impacts are considered; for example, costs to the Shetland community have been considered to be upwards of £5.6 million per year when beach cleaning, costs incurred by aquaculture, power generation, farming, fishing, harbours and lifeboat launches are included16. Is totally natural packing feasible? Using plant-based bio-plastics or sustainable packaging, such as mushroom packaging, removes carbon dioxide from the atmosphere as the plants/fungi grow. The carbon becomes incorporated into the structure of the plants/fungi and this is held onto as the plant/fungi become part of the packaging. At the end of the packaging materials' life, the packaging, can be recycled or composted, the carbon being released back to the atmosphere or soil. Hence this product produces no net increase of global carbon. There is an increasing range of renewable-resource-based alternatives (see Box 2), primarily from corn, sugar cane and starch but also bamboo, algae, seaweed, cashew nuts, and byproducts from biofuel manufacture, as well as new packaging solutions such as mushroom packaging. The long-term feasibility of these products will depend not only on the renewability and carbon footprint of these products, but on their competition and complementarity with alternative land uses. Will these emerging low carbon, renewable technologies drive global markets for photosynthesis derived products? What are the implications for land currently used for food and energy production or land that has value for wildlife and nature conservation? These questions are difficult to answer but as more studies and life-cycle analyses of new product ranges are undertaken the picture will become clearer. Studies to date indicate that competition with other land uses (agriculture, biofuels) is not currently significant. This is because many of the alternative packaging options often use waste products from a variety of rural based industries. Moreover the global distribution of bioplastics manufacturers limits the geographic concentration of raw materials demand. Clearly the majority of the plastic packaging we currently use adversely impacts biodiversity, and will continue to do so for many and in some cases hundreds of years. Turtles mistake plastic bags for jellyfish, one of their main food sources, and many species of birds such as albatross mistake the smaller plastic pellets for fish eggs or the red plastic for squid. They mistakenly scoop up the plastic, together with any surrounding debris and feed it to their chicks12, many of whom then suffer from poor nutrition. As a result many species of albatross, such as the Laysan Albatross (Phoebastria immutabilis), are threatened with extinction. The United Nations Environment Programme estimates that plastic debris causes the death of over one million seabirds and at least 100,000 sea mammals each year20. Six of the seven species of sea turtles and 44% of seabirds are affected by ingestion of marine debris21. The longevity of plastics in the marine environment also enables other species to ‘piggy-back’ on the plastic and disperses around the oceans – potentially causing problems with invasive alien species22. By comparison, mushroom packaging decomposes readily if littered, and, should it be ingested, poses no risk to wildlife although it has no nutritional value23. Any switch to renewable-resource-based plastics would seem to have several significant advantages. The fungi kingdom is estimated to have 1.5 million species, of which, over 90% are yet to be identified24. Fungi are principle decomposers and play a critical role in nutrient recycling, often working in partnership with other species (symbiotic relationship), such as the roots of various plants (as mycrorrhiza), and providing nutrients their partners’ growth25. Fungi grow in all the major ecosystems, from the polar regions to the deep seas, but tend to be largely overlooked. Only two species have been identified as being at risk of extinction26. Different species of fungi display different characteristics, meaning that the potential of this group of species to support industrial innovation could be enormous. Increasing packaging legislation and the banning of chemicals, many of which are found in household plastic items27, 28, within the EU and nationally is placing greater demands on producers to reduce packaging, packaging waste and composition. The move to non-petroleum based, natural and biodegradable packaging products has the potential to reduce human reliance on fossil fuels, reduce associated carbon emissions, and at the same time reduce plastic waste and its impact on the environment. The alternative packaging concepts examined above offer the opportunity to use biodiversity for multiple benefits, including protecting biodiversity. KIMO (2010) Marine Litter: An increasing threat to the health of our marine eco-systems Kommunenes Internasjonale Miljøorganisasjon.